​The fishing industry has not been left behind as far as technological advances are concerned. So many devices are being continually invented to make fishing easier and efficient. A fish finder is an instrument for locating the presence of fish underwater. It uses echo-location to sense and track fish, track the boat and also to track the fishing waters. Then it converts the information into a graphical image which you can view. Without a fish finder, a fisherman is relatively blind. The instrument acts as a guide, giving the captain or fishermen up to date real-time information during their fishing expedition. It removes guessing out of fishing. Fish finders are used to do both commercial fish farming and recreational fishing. Here is why you need a fish finder during your fishing expedition. A fish finder is a necessary tool for fishing. It helps you to know what is underwater when fishing. This helps you to identify the best fishing spots. The fish finder helps you to identify the fish habitat. Fish are found underwater throughout the year. But they keep moving and changing their location during the day. Fishing is easier when you can can know where the fish is when you are fishing. Therefore one of the most important features that you need in a fish finder is to show you the fish habitat. Some fish finders are designed with mapping technology and a GPS. Once you identify a fish habitat, you can map it and keep coming back to the same location in your future fishing expeditions. Fish don't stay in one place. They keep moving as temperatures, tides, winds, and seasons change. Because it is hard to spot fish underwater with your naked eyes a fish finder is excellent for locating schools of fish. Ice Fishing is gaining popularity as a fishing activity. Ice Fishing is more challenging than normal fishing. What's more, ice Fishing has been made easier by a fish finder. A fish finder can help you identify what is under water. You can know if it is a rock, a fish species or a bait. Fishes that follow their bait include catfish, bass, game fish and others. You can’t catch these fishes where there is no bait. The fish finder helps you identify where there is bait in the fishing waters. This makes it easier to catch some species of fish like bass. A fish finder will help you identify specific fish species under water. A fish finder will help you identify the size of fish and the shape of the fish. You will also be able to tell how deep the fish is in the water. Therefore, a fish finder makes target fishing easier. ​Also, because a fish finder can help you know the water temperature, it helps you in fishing certain fish species easily. For example to do bass feeding in the United States require certain temperatures. Therefore the fish finder makes bass fishing easier. For a successful fishing trip, you need to know the depth of the waters. A fish finder helps you to determine the depth of the fishing waters and also helps you categorize the bottom structure of fishing waters into either rock, gravel, mud or sand. In addition to the many roles that a fish finder serves, it also has a feature to show you the fishing temperature waters. The fishing water temperatures determine the activity of your target fish. Fish prefer operating in warm waters. Too cold or too hot temperatures often render the fish inactive. The temperatures of the fishing waters determine the success of your fishing venture and determine how much fish you will actually catch. You can read our another article on "best time to go fishing of a day" to learn more. The many features of a fish finder serve to guide you on your fishing expedition, giving you information about the current state of affairs. The structuremap gives you information on the topography of the fishing area and then displays it on a chart. Information about your kayak, fish habitat, water depth, water temperature, GPS, among others, the fish finder helps you work efficiently, in real time using up to date information. No more doing blind fishing when you have a fish finder. Because the naked eye cannot see the deep waters nicely the fish finder is like your eyes at the bottom of the waters. It helps you locate your target fish quickly and you, therefore, target to lure your target fish with baits efficiently. Modern fish finders have a dual screen, GPS, maps and other excellent features to enhance your fishing experience. When buying a fish finder look for the latest models with excellent brightness, contrast and that are high-resolution. ​The latest models of fish finders have a technology that will show picture like images of your boat surroundings. You can also capture images of what is ahead of the boat while fishing. Wi-fish is a feature that comes with the latest fish finder models. The fish finders have features that can enable you to go back and scroll through images in your history. The feature also allows you to connect your fish finder to your iPhone or tablet and be able to post your fishing expeditions on social media. No technical expertise is required to operate a fish finder. The fish finder can be used by all fishermen. A fish finder offers great benefits to both inexperienced and professional fishermen. It acts as a guide through your fishing journey. To enjoy fishing, you need to be successful at catching fish. To be successful at fishing, it is important to get the right fishing tools. A fish finder is a must-have fishing device. When out fishing you want accuracy when casting your net or baits. The fish finder will help know where to cast or throw. 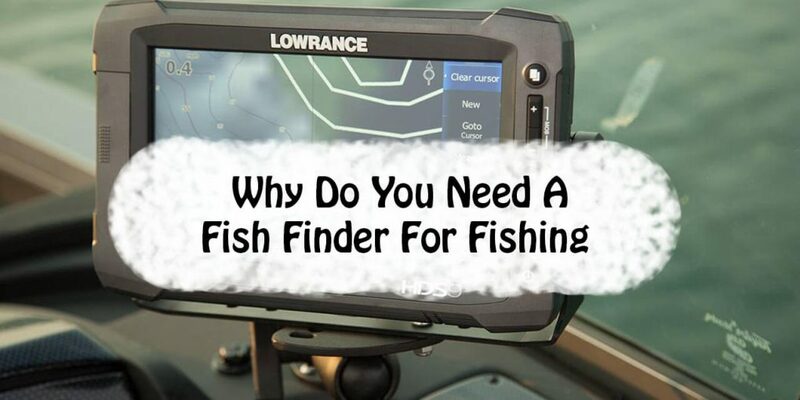 Because the fish finder will help you locate fish, locate bait, and know about the status of the fishing water, including depth, temperatures and structure of the bottom waters, then you are likely to catch more fish than when operating without a fish finder. ​Your fishing expedition will be well informed and more successful because you are able to find fish easily and conveniently. Therefore a fish finder enhances the overall fishing and sight-seeing experience.